WordPress is a very popular blogging platform. We have a number of posts on how to set it up and keep it up to date on here already. In general those methods focus on deploying under the Apache web server. Recently we were pointed to a scripted method developed by they guys at rtcamp.com. They have a bunch of python scripts that have developed into a pretty neat tool-set for fast easy WordPress setup under Nginx. You can use an existing mysql database service or let the tool install the latest version of the high performance mariadb database. EasyEngine also configures email so you can get all those useful notices from your new wordpress install. And sets up basic security to help you get started with confidence. It includes change control using git, which should be very handy for developers. And implements a built in backup function (ee site backup) and the ability to update wordpress from the command line. * have a working dns name to use for this, or be prepared to use a local /etc/hosts trick so you can test the site after the install is done. * if you already have mysql and apache installed you may wish to remove them first to avoid package conflicts. Consider this if you already have sites on your server you want to keep running. Here is a summary of the commands I ran. It will take about 10-15 minutes to complete. The install log below is from a clean Debian 8 (jessie) VPS. Notice the initial login details are provided for you during the setup process (obscured). By default the tool puts site files for the site live under /var/www/. 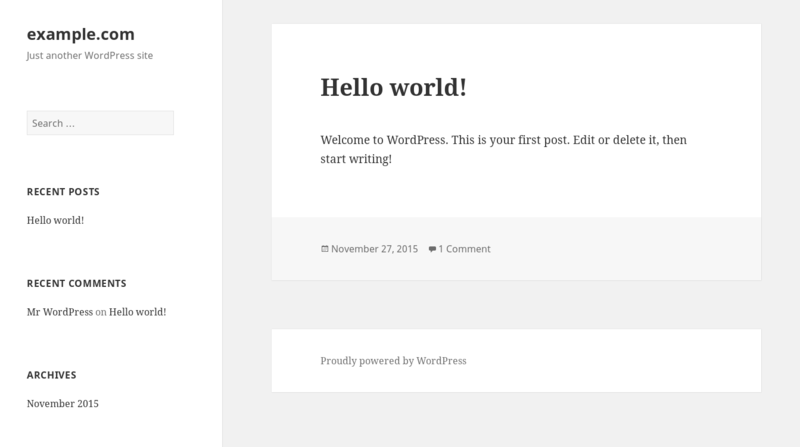 Presto, the new wordpress blog is alive! If everything has gone well, you should also have an introduction email from wordpress at the address you gave during the install. The 'ee' tool has a lot of different install options, and is powerful enough that you could use it exclusively to manage all your sites on a single server. More details are on the documentation page. This entry was posted in HOWTO and tagged easyengine, mariadb, nginx, wordpress. Bookmark the permalink.